After six months visiting wine regions in Europe I feel like I am beginning to come full circle. Every major wine-producing country has been covered, and with the exception of Bordeaux (next week) and Burgundy (the end of the year), every important wine region has been visited. The experience and knowledge I have acquired since the beginning of the year scares me slightly, and I hate the idea that I am becoming jaded with my knowledge of wine. I think the time I have planned in the UK and Ireland through August will do me some good, as it will refresh me for working vintage in Germany from mid-September. Probably the main reason that I am feeling a sense of déjà vu is the similarities that the Douro Valley has with the Mosel Valley, which I visited all the way back at the end of January. The way the calm and wide river makes its slow progress to the Atlantic Ocean is hauntingly similar to the Mosel, as well as the deep valley with steep slopes planted with terraced vineyards. They even have some slate/schist here, but a lot more granite and even limestone. There is obviously one glaring difference which is the climate. It is very hot here, often reaching well over 40 degrees in summer, whereas the Mosel is not. When I was in the Mosel it wasn’t getting over zero degrees; on my first day in the Douro it got up to 39 degrees. So a little bit different. I came here to not only actually see the vineyards where the port wine comes from, but to also explore a rapidly growing part of the Douro for dry table wines, getting quite a following. My day started in the eastern part of the region which originally wasn’t part of the demarcated area of the Douro Valley. The winery I visited was Quinta do Vale Meao which was established by one of the most important people in the region and for port wine. Her name was Antonia Adelaide Ferreira, and she established the Ferreira port house which was so important because it was the largest Portuguese owned port houses in a time where most of the power and influence was wielded by British houses. Many generations later she had numerous descendants that were both directly and indirectly involved with the running of the company she left that included many estates and facilities. When the family decided to sell to the Portuguese wine company Sogrape the great-great-great-grandson of Antonia, Francisco Javier de Olazabal (Vito), was invited to join the company and continue the legacy left, and ended up staying with them for over a decade in senior positions. During this time he bought one of the most important estates owned by Antonia and decided to replant the vineyards and sell the fruit. His son Francisco like so many new generations of Portuguese wanted to achieve the recognition and true benefit of making wine from their own estate, and managed to convince Vito to establish a Quinta which meant him leaving a secure and comfortable life with Sogrape and take a leap of faith. Thankfully through a lot of hard work and a little luck, they have found great success. Quinta do Vale Meao is in the Douro Superior part of the Douro region, in the far eastern valleys closer to the Spanish border. Back when Antonia established the Quinta in the area was not part of the demarcated zone that as I have already mentioned was one of the first in the world, and it was the only one that she owned she established from scratch. The climate here is decidedly warmer and also drier, and was only intended as an area for port fruit like the rest of the valley. Vito and his son saw the trend away from port wine towards table wine in the markets, and thanks to Vitos experience with Sogrape and their production of table wine, and also Francisco‘s training as a oenologist they were able to establish themselves as predominantly still wine producers in a fairly extreme location. One of the lucky decisions Vito made was to focus his re-planting on the touriga nacional variety, which at the time was not favoured for port wine as it required more attention and is relatively low-yielding and thus didn’t make fiscal sense. Today it is considered to be the most important grape from Portugal and many of the top quality wines in the country are produced from it. 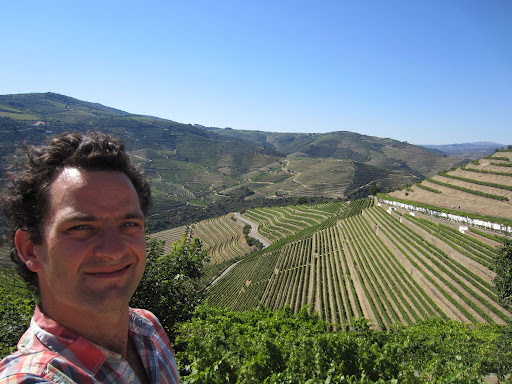 Vito took me up into parts of the vineyards to show me the undulation of the hills and also the way the Douro River rolls around the estate in a meandering pattern (which is also why one of the wines is called Meandro). He explained that another lucky thing to happen was the damming of the river further downstream meant he lost part of his property, but the vineyards in this area were not particularly good. The property lost to the dam was very healthily valued and he was thus able to afford to further develop other parts of the property that showed more potential. Currently they are building new facilities to add to the historic parts that were built in the late 19th century. Previously the storage of wine in all formats was conducted in the same large warehouse-type area, but with gradual expansion was beginning to get quite cramped. New areas have been built for the packaging and storage of finished wines, and the existing room will be exclusively used for tanks and barrels. The ancient lagares have been modernised to allow for easier access, maintenance and cleaning, and an automatic pigeage has been designed and installed to perform the work of ten pairs of legs. Once the fruit has been crushed de-stemmed and put into the lagares only the initial plunging is performed manually by foot, and any subsequent plungings are performed mechanically for efficiency and control. The red wines are drained off and complete the fermentation in vats, whereas the port wines perform the fermentation completely in the lagares. As is traditional in northern Portugal the wines are generally field blended and varieties are treated together, only parcels of fruit are kept separate. The winery currently only produces three wines; the Meandro, the Quinta de Vale Meao and a Vintage Port in good years. They are building their stocks to eventually release tawny ports in the future. Over lunch with Vito and mother, I was able to taste a few of the recent vintages of the wines as well as the 2002 Vintage Port, and you can read my notes here. 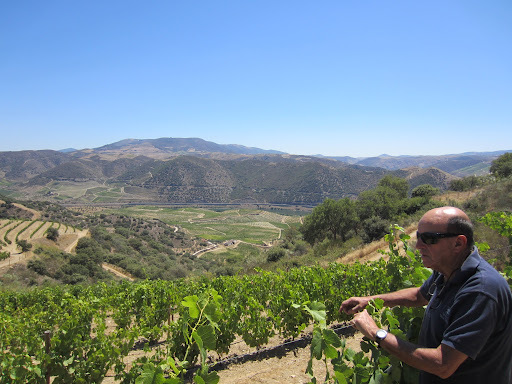 Quinta do Noval has had an illustrious history with many owners. It is now in the capable hands of AXA, a French company that owns other famous estates like Chateau Pichon-Longueville in Bordeaux and Disnoko in Tokaji, Hungary. When they acquired the business it needed a little bit of modernising, but the assets of the business were all there; old-vineyards in one of the best and most historic parts of Douro, old stocks of port ageing in barrels, historic lagares and centuries of tradition and accumulated knowledge. They wanted to retain as much of the traditional practices that made Quinta do Noval so great in the past, and so a number of things are continued today. 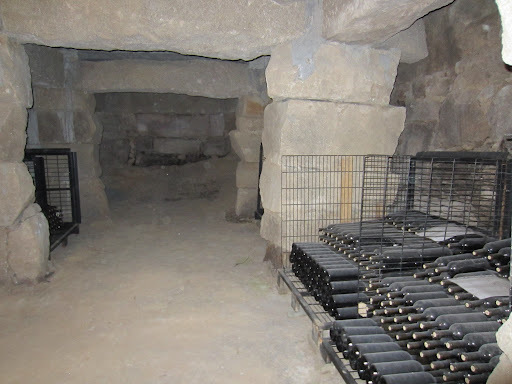 One of these is the program of foot-plunging in the granite lagares, with a team of eight men in total silence apart from the leader who calls each ‘stroke’ for the first two hours. The third hour is considered ‘free time’ when the workers are allowed to talk and walk as they please, even eat and drink, as long as they don’t leave the lagar. The winery was gravity-designed from the beginning, which wasn’t difficult considering how steep the slope of the hill is. For anyone who has problems with heights I don’t recommend visiting the Douro Valley, or at least the higher parts of the vineyards. The main property of Noval and the winery are all several hundred metres from the river, and the vines and roads perch precariously on the side of the hills. They really look after their staff at Quinta do Noval. All the workers live/stay down in the villages and are transported up to the estates each day for work, and they are fed each day from the kitchen that prepares their meals. They are provided with wine as is their right and they often have big dinners to celebrate things like the end of vintage. 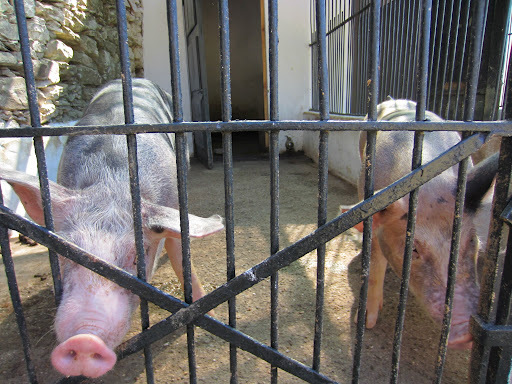 Vegetables are grown on the estate and they keep various animals including chickens, ducks, geese and even pigs, the latter which looked delicious. Back when the pickers would be carrying 70 kg baskets of fruit on their back (a lot more than the 20 kg now), they had trouble seeing where they needed to get up the hill to the winery, and so the owner used white paint near the steps to help guide them. This adds an interesting brightness to the vineyards, particularly on sunny and hot days they are experiencing at the moment. The winery has joined many others and now produces a number of still wines to add to their world-class port wines, and a different facility down the hill has been built to produce these. Different to many other important port producers they don’t age their ports in Gaia after their lodge burnt down many years ago, and now age them at the Quinta. Because of the huge fluctuations in temperature and lack of humidity, they had to retro-fit the warehouse here to recreate the atmosphere they enjoy in Gaia. Click here to read my notes from the tasting. 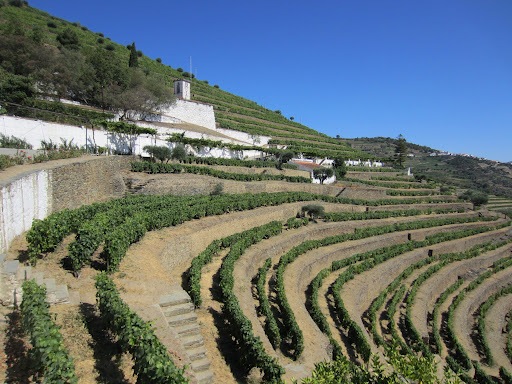 Click here to see more photos from my first day in the Douro Valley, Portugal. My first night was spent with Niepoort who I visited on my second day, along with my hosts for the second night Quinta da Vallado.